“…where part of Lewis Carroll’s immortal children’s books were written”. 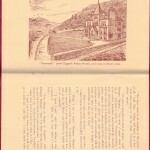 Here we have an unusual booklet probably published by the Gogarth Abbey Hotel in the mid twentieth century. 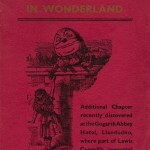 It is a charming attempt at tempting visitors to stay at the hotel whilst also reinforcing the Alice in Wonderland link. This entry was posted in Penmorfa Paintings. Bookmark the permalink.